Motocross is an extremely popular sport, but it can also be dangerous. Even when taking things slowly, motocross riders work every muscle in their body. The risk of injury increases as the speed increases. One common injuries in motocross are wrist fractures, because the natural instinct when falling is to put your hand out to break the fall. Wearing a wrist brace for motocross can help prevent injury if a fall does occur, and can also reduce wrist strain from gripping the handlebars. As a motocross rider, it's essential to find a wrist brace that offers stabilization and protection that is also comfortable and durable. 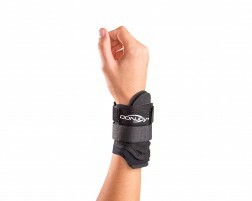 We’re proud to offer a wide selection of wrist braces for motocross riders and athletes. Browse additional braces for motocross.